Recently built this 2m SlimJim antenna using Twin lead TV Feeder wire. This TV feeder wire was thrown away somewhere deep in the junk since the era of satellite TV arrived few years back. Please note most of the designs on the internet for SlimJim antenna show total length of more than 150 Cms or above 55 Inches. In fact, the calculators asks for around 59 Cms of total length of the Slimjim Antenna. I made it using this design and my antenna failed miserably at the “wanted” frequencies. It actually, gave a close to 1:1.1 SWR reading at around 160 Mhz. This is nowhere close to our Amateur VHF band. There was something really wrong. So VU2ASH and me decided to vary/change each dimension to find the perfect length to get good SWR at 145 Mhz. After a lot of trial and error and almost 15 cuts and joins of the TV feeder we managed to get good SWR for the wanted frequencies. Below is the picture with parameters / dimensions. I then replicated the above dimensions on a good piece of TV feeder cable and the new clean antenna too gave very good results on 145 Mhz. In fact, the SWR was below 1:1.2 from 144 – 146 Mhz 2m band. The result was really good. I made a test contact with a fellow ham VU3LBQ with this SlimJim mounted in the balcony of my apartment on the 1st floor and a Ground plane antenna mounted on the 4th floor terrace. He was hardly audible with the Ground plane in the terrace, but on SlimJim we got a readable signal even on the 1st floor. 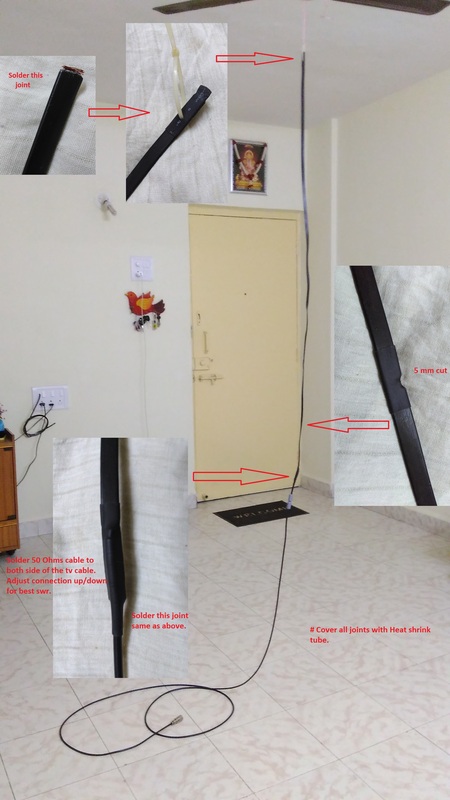 If you have any questions or suggestions for this antenna, do leave your comments in the section below. At HF the TV twin lead is affected by rain and snow. 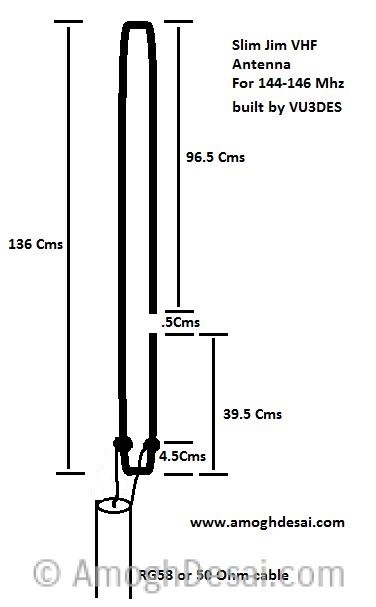 Have you checked to see if water or pollution affect the slim Jim at 2meters? The antenna is for VHF 2 meters (I guess that was a type in your comment). I mostly use it as a portable, so not more then few hours when its used in open. I have also seen people putting this type of antennas inside a PVC pipe for mounting it out in the open where UV/Rain/Snow or heat might affect. 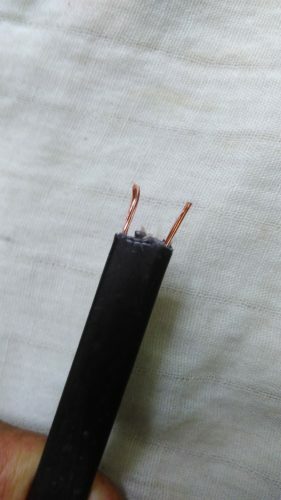 may i know if what the recommended length of rg58 cable? There is nothing as such recommended for the feeder cable. Its as much you need from the antenna (from the rooftop) to your receiver/transmitter. I need to use about 20 meters from my terrace to my transceiver. you can use accordingly.